These questions are less requests for information than expressions of parental anger and a form of verbal punishment. The resounding message of disapproval triggers the child’s sense of shame or defensiveness, shutting down communication and interfering with the opportunity to learn from mistakes. Although we can’t entirely eliminate the word “Why” from our vocabularies, better questions will lead to clearer communication and truly teachable moments. Children learn everything they know – how to walk, talk and get along in the world – through trial and frequent error. They live in the moment and choose to do things because they feel like it in that moment. Only after repeatedly making mistakes (sometimes the same one, over and over again) do children learn to anticipate the consequences of their actions. 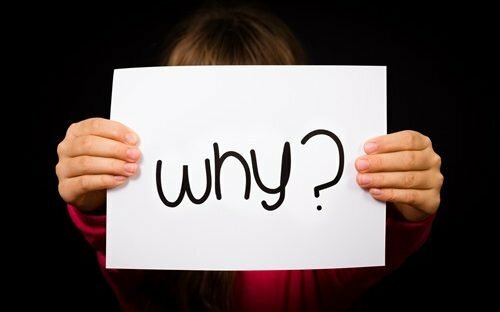 When parents ask “Why?” the most honest answer a child can give in most cases is “I don’t know” or “Just because I felt like it.” Asking “Why?” is counterproductive because it encourages children to make excuses or cast around for someone else to blame. It implies that the parent expects the child to rationalize his past behavior when what we really want is for him to analyze what went wrong, make amends for any harm done and find solutions leading to better outcomes in the future. Did that work out the way you planned? That didn’t seem to go so well. How do you think you can fix things? Unlike “Why” questions, these less confrontational, more reflective queries avoid punitive shaming and blaming and keep the focus on personal responsibility. With repetition, they will become internalized questions that children instinctively ask themselves whenever they make mistakes. Kicking the “Why” habit is one crucial way for parents to provide children with the tools they need to continually assess and improve their behavior and their understanding of the world. Isn’t that what parenting is all about?